The Battle of Mont St. Quentin was a battle on the Western Front during World War I. As part of the Allied counteroffensives on the Western Front in the late summer of 1918, the Australian Corps crossed the Somme River on the night of August 31, and broke the German lines at Mont St Quentin and Péronne. The British Fourth Army's commander, General Henry Rawlinson, described the Australian advances of August 31 – September 4 as the greatest military achievement of the war. 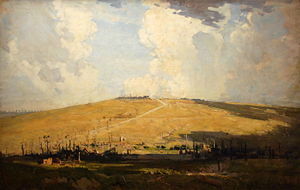 During the battle Australian troops stormed, seized and held the key height of Mont St Quentin (overlooking Péronne), a pivotal German defensive position on the line of the Somme. At the Battle of Hamel on 4 July 1918 Monash, with the support of the British 4th Army commander Sir Henry Rawlinson commanded the 4th Australian Division, supported by the British 5th Tank Brigade, along with a detachment of US troops, to win a small but operationally significant victory for the Allies. On 8 August 1918, the Battle of Amiens was launched. Allied troops under the command of Douglas Haig, predominantly Rawlinson's British 4th Army (consisting of the Australian Corps under Monash and the Canadian Corps under Arthur Currie, and the British III Corps) attacked the Germans. The allied attack was spearheaded by the Australian Corps, who had been given the capture of enemy artillery as a key objective in the first phase by Monash in order to minimize the potential harm to the attacking forces. The battle was a strong, significant victory for the Allies, the first decisive win for the British Army of the war, causing the Germans to recognise that for them the War was lost. The defeated German leader, General Ludendorff, described it in the following words: "August 8th was the black day of the German Army in the history of the war". These operations were just a start of a broad Allied offensive across the Western Front. On 12 August 1918 Monash was knighted as a Knight Commander of the Order of the Bath on the battlefield by King George V, the first time a British monarch had honoured a commander in such a way in 200 years. The Australians then achieved a series of victories against the Germans at Chignes, Mont St Quentin, Peronne and Hargicourt. Monash had 208,000 men under his command, including 50,000 inexperienced Americans. Monash planned the attack on the German defences in the Battle of the Hindenburg Line between 16 September and 5 October 1918. The Allies eventually breached the Hindenburg Line by the 5th of October, and the war was essentially over. On 5 October, Prinz Max von Baden, on behalf of the German Government, asked for an immediate armistice on land, water and in the air.